New data from NASA's Cassini mission, combined with measurements from the two Voyager spacecraft and NASA's Interstellar Boundary Explorer, or IBEX, suggests that our sun and planets are surrounded by a giant, rounded system of magnetic field from the sun—calling into question the alternate view of the solar magnetic fields trailing behind the sun in the shape of a long comet tail. The sun releases a constant outflow of magnetic solar material—called the solar wind—that fills the inner solar system, reaching far past the orbit of Neptune. This solar wind creates a bubble, some 23 billion miles across, called the heliosphere. Our entire solar system, including the heliosphere, moves through interstellar space. The prevalent picture of the heliosphere was one of comet-shaped structure, with a rounded head and an extended tail. But new data covering an entire 11-year solar activity cycle show that may not be the case: the heliosphere may be rounded on both ends, making its shape almost spherical. A paper on these results was published in Nature Astronomy on April 24, 2017. "Instead of a prolonged, comet-like tail, this rough bubble-shape of the heliosphere is due to the strong interstellar magnetic field—much stronger than what was anticipated in the past—combined with the fact that the ratio between particle pressure and magnetic pressure inside the heliosheath is high," said Kostas Dialynas, a space scientist at the Academy of Athens in Greece and lead author on the study. An instrument on Cassini, which has been exploring the Saturn system over a decade, has given scientists crucial new clues about the shape of the heliosphere's trailing end, often called the heliotail. When charged particles from the inner solar system reach the boundary of the heliosphere, they sometimes undergo a series of charge exchanges with neutral gas atoms from the interstellar medium, dropping and regaining electrons as they travel through this vast boundary region. Some of these particles are pinged back in toward the inner solar system as fast-moving neutral atoms, which can be measured by Cassini. "The Cassini instrument was designed to image the ions that are trapped in the magnetosphere of Saturn," said Tom Krimigis, an instrument lead on NASA's Voyager and Cassini missions based at Johns Hopkins University's Applied Physics Laboratory in Laurel, Maryland, and an author on the study. "We never thought that we would see what we're seeing and be able to image the boundaries of the heliosphere." Because these particles move at a small fraction of the speed of light, their journeys from the sun to the edge of the heliosphere and back again take years. So when the number of particles coming from the sun changes—usually as a result of its 11-year activity cycle—it takes years before that's reflected in the amount of neutral atoms shooting back into the solar system. Cassini's new measurements of these neutral atoms revealed something unexpected—the particles coming from the tail of the heliosphere reflect the changes in the solar cycle almost exactly as fast as those coming from the nose of the heliosphere. "If the heliosphere's 'tail' is stretched out like a comet, we'd expect that the patterns of the solar cycle would show up much later in the measured neutral atoms," said Krimigis. New data from NASA's Cassini, Voyager and Interstellar Boundary Explorer missions show that the heliosphere -- the bubble of the sun's magnetic influence that surrounds the inner solar system -- may be much more compact and rounded than previously thought. 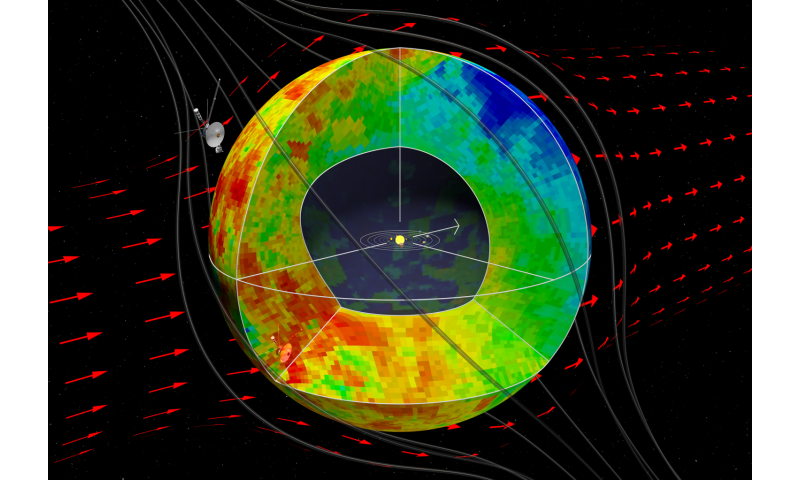 This illustration shows a compact model of the heliosphere, supported by this latest data. The main difference between this and previous models is the new model's lack of a trailing, comet-like tail on one side of the heliosphere. Credit: Dialynas, et al. But because patterns from solar activity show just as quickly in tail particles as those from the nose, that implies the tail is about the same distance from us as the nose. This means that long, comet-like tail that scientists envisioned may not exist at all—instead, the heliosphere may be nearly round and symmetrical. A rounded heliosphere could come from a combination of factors. 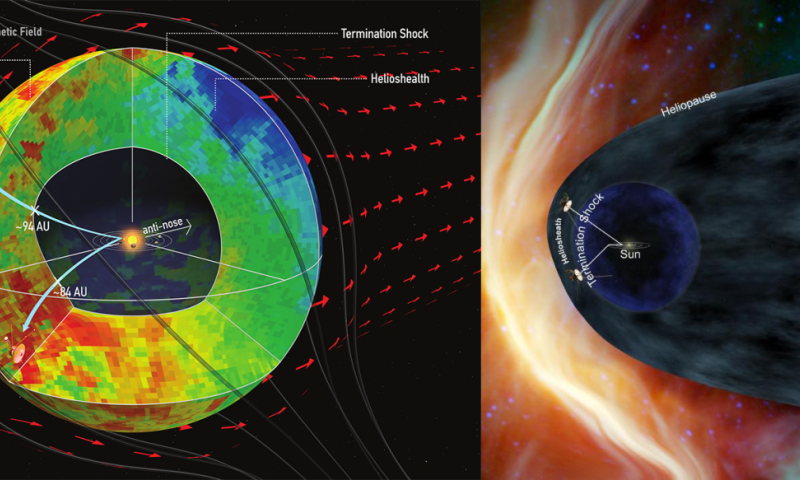 Data from Voyager 1 show that the interstellar magnetic field beyond the heliosphere is stronger than scientists previously thought, meaning it could interact with the solar wind at the edges of the heliosphere and compact the heliosphere's tail. The structure of the heliosphere plays a big role in how particles from interstellar space—called cosmic rays—reach the inner solar system, where Earth and the other planets are. "This data that Voyager 1 and 2, Cassini and IBEX provide to the scientific community is a windfall for studying the far reaches of the solar wind," said Arik Posner, Voyager and IBEX program scientist at NASA Headquarters in Washington, D.C., who was not involved with this study. "As we continue to gather data from the edges of the heliosphere, this data will help us better understand the interstellar boundary that helps shield the Earth environment from harmful cosmic rays." You mean the observation didn't match the prediction? Again? The importance of such observations cannot be over-emphasized. 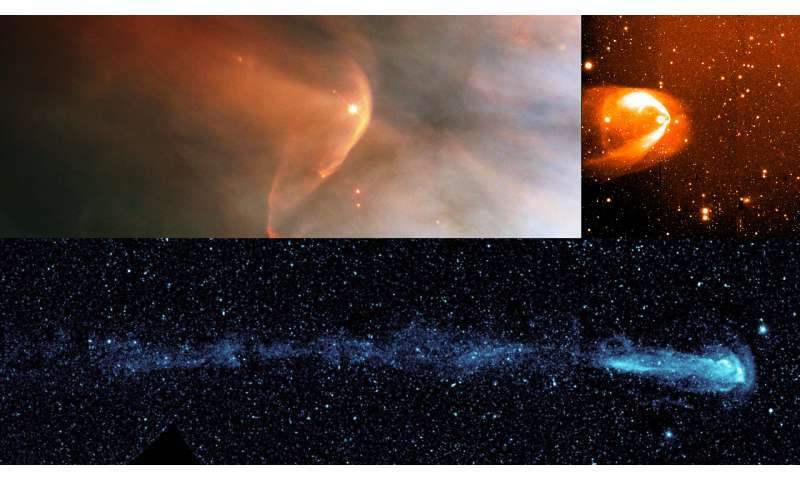 We plainly see electromagnetic forces dominating outside of the solar system -- and if theorists weren't on this quest to prove the textbooks, they would be questioning their mechanical bowshock ideas for the heliosphere right about now. But, since numerous fundamental questions are by now out-of-bounds / "settled", my expectation is that the observations will somehow once again be rolled into fluids / mechanics. If Wal Thornhill is correct, there are more surprises for theorists coming on the structure in this region. He believes he understands the meaning of the ENA ribbon as well as the high-energy particles coming at us from no observable source. How much energy transfer would there be from the interstellar magnetic field on the heliosphere? It seems like it is acting like a natural magnetic Galactic sail. Re: "How much energy transfer would there be from the interstellar magnetic field on the heliosphere? It seems like it is acting like a natural magnetic Galactic sail." You're going to get different answers to that question based upon your starting-point assumptions -- the two major ones being mechanical bowshock vs plasma double layer. The fact that this is more sphere than comet-like seems to throw shade on the idea that this system is akin to a boat moving through a fluid. But, something else to consider -- which is also debated -- is if the sphere results from a magnetic or ELECTRIC field. The fact that the solar wind fails to appreciably decelerate even as it passes the Earth's orbit suggests that the Sun has a weak electric field. In the electrical view, the heliopause is the "virtual cathode" for the Sun's plasma glow discharge. But, we are still in the phase where if you say that to an astrophysicist, he will look at you like you're an alien. I think they reality of the situation is that they are too appalled at the rudeness of these online comments to make any appearance. When all you have is conjecture an appearance is unlikely. Doesn't stop the BB, BH, DM pseudoscience enthusiasts, does it? not necessarily a fan of BB, here. But, how else do you explain the gravitational effect that BH and DM seem to indicate? "But, how else do you explain the gravitational effect that BH and DM seem to indicate?" That doesn't seem all that rational. But, how else do you explain the gravitational effect that BH and DM seem to indicate? Pretty simple with my theory, BH are essentially 2d discs comprised of only fundamental particles, and DM/DE are just the hydrogen and helium fields misinterpreted as "extra gravity". Electric fields and electric gravity, simple as Occam's Razor demands.